The cheese and and cooked rice are mixed in with the meat. Rice adds a little bulk to the bison meat adding to the number of burgers and stretching your saving dollar, while at the same time retaining the goodness and healthful benefits that this clean and lean meat provides. The cheese adds a smokey flavor and moisture inside the burger. Place meat, rice, cheese, 1 tablespoon barbecue sauce, paprika, mustard, garlic, pepper and salt in a large bowl. Gently combine, without over mixing, until evenly incorporated. Form into 4 equal patties, 1/2 to 3/4 inch thick. Combine the remaining 1 tablespoon barbecue sauce, mayonnaise, relish and horseradish in a small bowl. Oil the grill rack (see Tip). 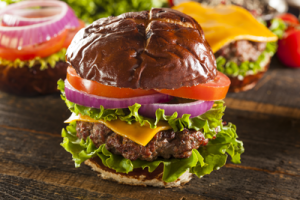 Grill the burgers until an instant-read thermometer inserted in the center registers 155°F, 5 to 6 minutes per side. Assemble the burgers on buns with the barbecue mayonnaise sauce, tomato and onion. Northfork Bison ships it right to your door. Best prices and best service.